We’ve said it before but the fact remains: We will eat any stupid new flavor of Oreos that parent company Mondelēz International ships off to market. 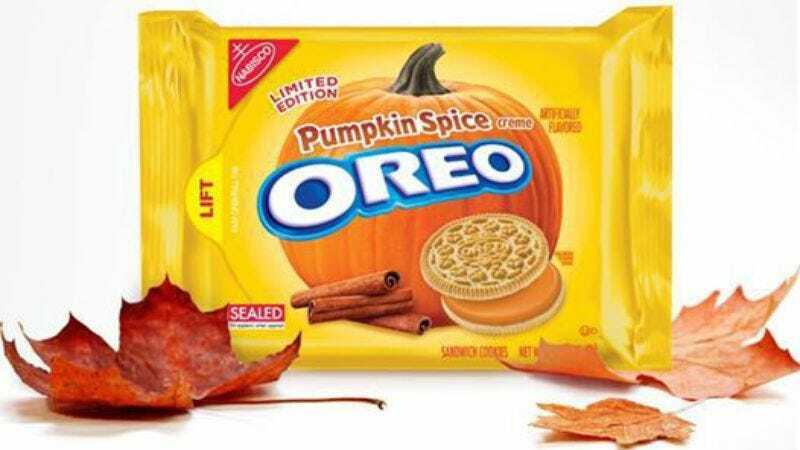 And thus, once hipped to the existence of Pumpkin Spice Oreos, we set off on far too lengthy a quest to find them before finally stumbling on stacks on stacks on stacks of them at a Marc’s in suburban Cleveland. Verdict: Not terrible. They’re appropriately spicy and a little pumpkin-y, all while maintaining Oreo’s crisp cookie integrity. Our short video reviews are below, but be on special lookout for an expert opinion from The Onion’s Mr. Autumn Man, who knows pumpkin spice. Tasters below are (in order): Erik Adams, John Teti, Sonia Saraiya, Katie Rife, Laura M. Browning, and Josh Modell.